Dubai November 5: Sarfraz Ahmed led Pakistan continue their glorious run in the T20I format with another emphatic whitewash against one of the top-ranked teams of the shortest format. New Zealand bore the brunt of Pakistan’s hugely skilled T20I outfit as the hosts maintained an upper hand in the first two games before a clinical performance in the third match resulted in a 47 run win. In a team of full of world-class performers, Babar Azam led the way with the bat with his 78 run match winning contribution in the third match which took him past the 1000 run mark in the T20I format. 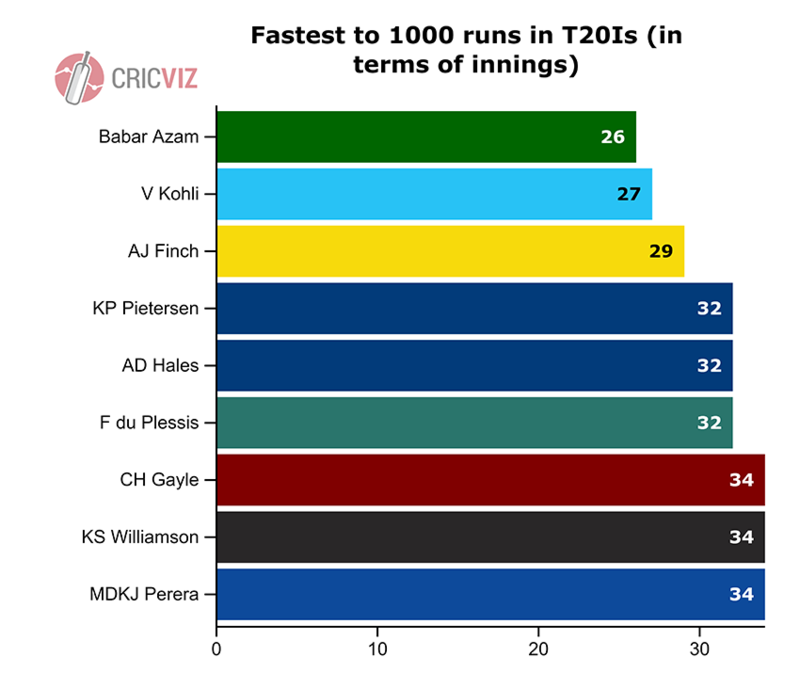 Babar is the fastest to the landmark, the right-hander reached the four figures in T20Is in a mere 26 innings, one innings less than the Indian batting star Virat Kohli as indicated by the CricViz graphic. Babar’s batting exploits were complimented by the brilliance of the seasoned campaigner Mohammad Hafeez who won the Man-of-the-Series award with his impressive run with the bat. Mohammad Hafeez scored 132 runs at a rate of 8.7 runs per over with a dot percentage of 28.5% in this series. In T20Is in UAE before this series, he had scored at 6.67 runs per over with a significantly higher dot percentage of 43.9% compared to this series. The CriViz graphic illustrates the same. 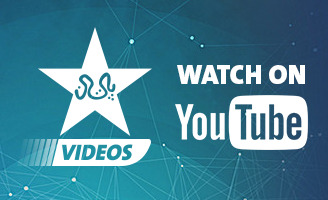 On the bowling front Pakistan’s multi-dimensional attack made consistent run scoring an insurmountable challenge for Australian and New Zealand batsmen. 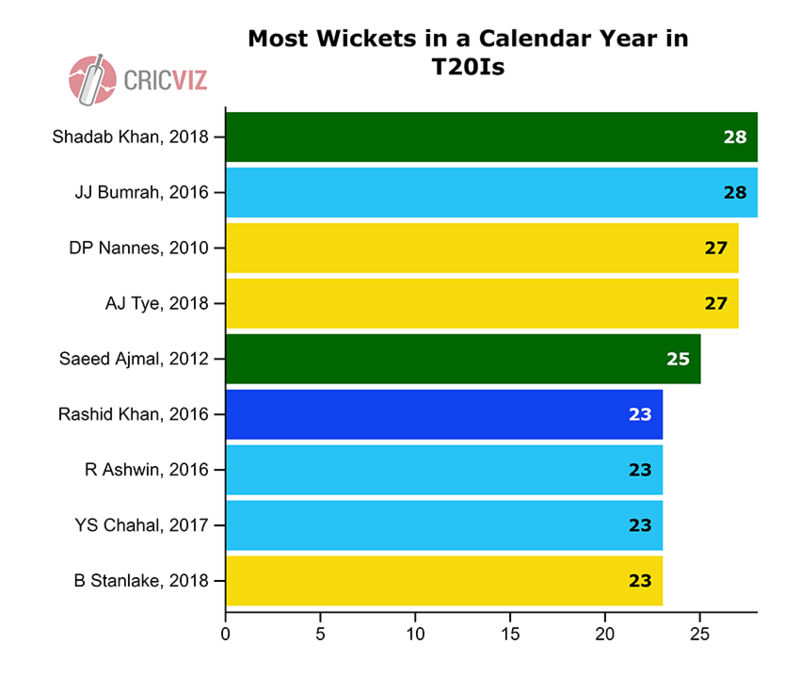 A combined effort by the pacers and spinners resulted in the 6-0 season score, leg-spinner Shadab Khan led the way for the calendar year returning an impressive 17 wicket haul, the joint best-ever in a calendar year. Pakistan’s magnificent run in the T20I format has also helped lift their win percentage in the UAE, this year the Green machine maintained a 100% record by winning all six games to make a marked improvement on their overall numbers in the UAE. In the period 2009 to 2015, Pakistan had an ordinary 40% success rate; the CricViz graphic illustrates the brilliant run this season. Pakistan also established another record with the win in the third and final T20I against New Zealand. 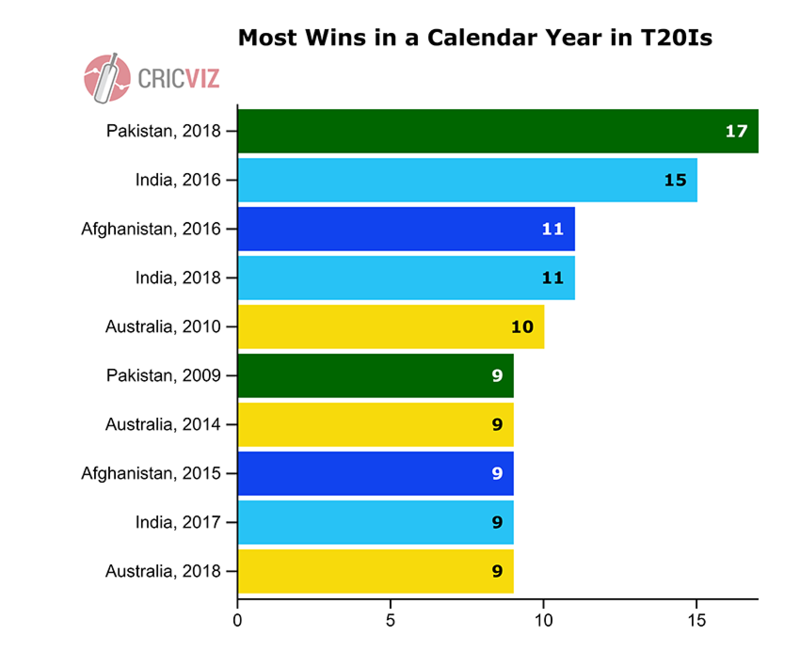 Sarfraz’s men now hold the record for most wins in a calendar year, the year 2018 saw them win as many as 17 out of their 19 matches, an astounding number indeed!